Swords are not merely deadly weapons used for injuring enemies or ending human lives. Some of them have gained renown and went down in history as legendary artifacts for the role they played in massive conquests and violent and bloody wars. This is why it is not so surprising that many of these bladed weapons that had been discovered bring with them stories that make some people believe they hold unknown powers or are simply cursed. More often than not, epic tales of their origins and the bizarre claims of what these swords were once capable of accomplishing when wielded by their owners are nothing more than mythical fiction. But over the years, experts have come across ancient swords that they believe serve as testament to the possibility that there may be some semblance of truth in some of the legendary tales that have been passed down for many generations. One such weapon is the Nanatsusaya no Tachi or the Seven-Branched Sword of Japan. It was said that the mysterious Seven-Branched Sword was re-discovered in the 20th century in Japan’s Isonokami Shrine in 1945. Situated in the foothills of Tenri-shi in Nara Prefecture, Japan, this 2000-year-old Shinto shrine is home to many of the country’s national treasures and has housed the original Seven-Branched Sword since antiquity. The sword is made of iron and is 2 feet and 5 and a half inches in length. Considering the unusual appearance of the sword, particularly the blade’s several branches, the Seven-Branched Sword is not a functional weapon for combat. And so, it is believed that it most likely served a ceremonial function and not a military one. In the 1870s, a two-sided inscription inlaid in gold was rediscovered on the sword’s blade by Masatomo Kan, one of Isonokami Shrine’s Shinto priests at the time. Unfortunately, due to abrasion and deterioration of the blade over the years, some of the characters of the inscription are now indecipherable. On one side of the blade, the inscription mentions that the Seven-Branched sword was “manufactured with hundred-times-wrought iron” and that it possessed a “magical power” that could repel enemy forces. On the other side, the inscription reveals who commissioned the forging of the sword and for whom it was made. The second inscription reads: "Never before has there been such a blade. The crown prince of Baekje's king, who lives under august sounds, had this sword made for King of Wa in the hope that it might be passed on to later generations." The ambiguity of some of the characters found in the inscription of the Seven-Branched Sword has caused much debate among experts, particularly regarding the nature of the relationship between Baekje and Japan. One interpretation of the inscription suggests that Baekje was a vassal state of Japan - a claim largely supported by many Japanese scholars. This would mean that the sword along with the other precious items sent by this old Korean kingdom to the ruler of Japan were equivalent to paying tribute to an overlord. In contrast, many Korean scholars insist that the relationship between the two states was reversed – It was the Yamato ruler the sword was given to who was the king of a vassal state that answered to the might of Baekje during that period. If the superior power and influence of Baekje at the time is considered, there is supposedly no reason why its kingdom would be the one to pay tribute to Japan - a nation which showed no evidence that it reached the same advancement that Baekje achieved during the same period. The translations of the sword’s faded inscription have been called into question many times, but what remains clear is that the Nanatsusaya no Tachi was a gift from a Korean royalty to a Japanese monarch. And a third interpretation of the inscription sees neither Baekje and Japan as the superior nation. Instead, some experts from Japan and Korea are of the opinion that the two countries during that time treated each other with respect and regarded one another as equals. 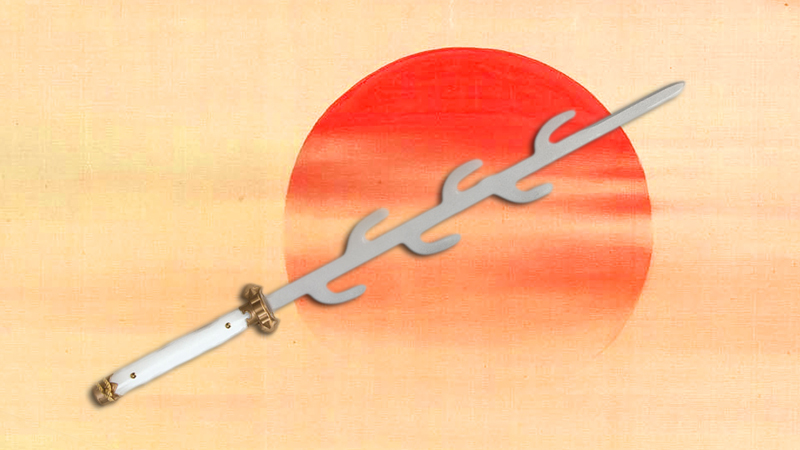 The Seven-Branched Sword is a significant piece of East Asian history for several reasons. First, the sword breathes life to the semi-mythical existence of Japan’s Empress Jingū, who supposedly ruled Japan in its early years after the death of her husband in 201 and before her son, Emperor Ōjin ascended to the throne in 269. It is believed that that the sword found in Isonokami Shrine is the same seven-branched sword mentioned in the Nihon Shoki, which chronicles Japan’s early history. The sword mentioned in this ancient text is a gift of the king of Baekje to a Yamato ruler during the 52nd year of Empress Jingū’s reign. If the ancient sword that exists today is indeed the same sword mentioned in the Japanese Chronicles, the empress’s controversial existence becomes more fact than legend, which gives her an official place in Japan’s imperial history. 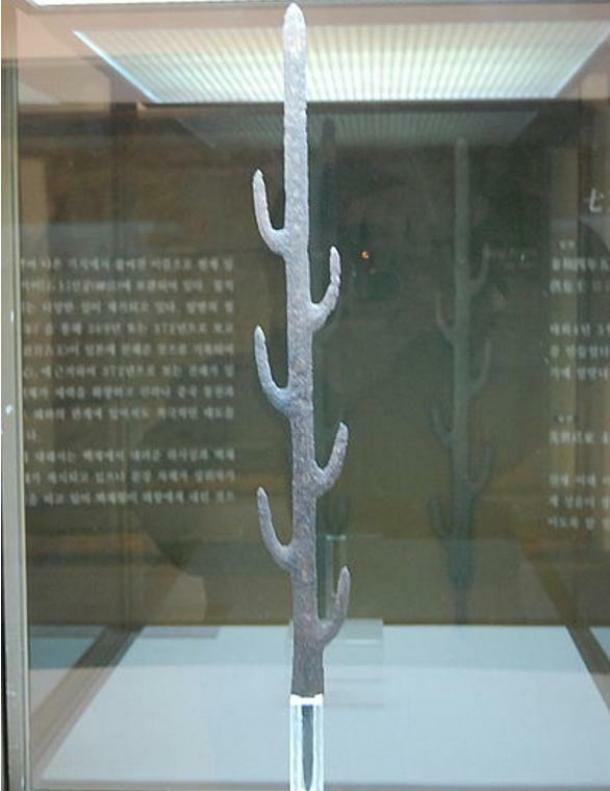 The second reason for the Seven-Branched Sword’s significance is that it is a tangible evidence of the level of knowledge and sophistication that the swordsmiths of Baekje possessed in metal industrial art. In fact, some experts have argued that the intricate process required to make the sword reflected the high standards of Baekje experts in making metal weapons, which in turn contributed to the improvement of Japan’s own process of metal craftmanship at the time. And the third reason for the sword’s importance is that its inscription, though heavily debated until now, is an indication that there was once a sincere and respectful relationship between the rulers of Yamato and the kings of Baekje. The value of several bladed weapons from our distant past are usually determined by the magnitude of the legends surrounding them and the potential impact such mythical tales may have on our actual history. However, not all swords of renown are prized simply because they were the possession of invincible warriors or was used to end the lives of many in the battlefield. Some swords are regarded as culturally significant and protected as world treasures because they represent a history of good faith between nations and their people. This is mainly why the Seven-Branched Sword is a priceless piece of East Asian history. Not only does it somehow validate the existence of a legendary empress, it also serves as proof that at some point in the tumultuous history shared between Japan and the kingdoms of the Korean peninsula, the two nations once forged a respectful and perhaps an equal relationship that they cultivated for many years. Today, the amount of care Japan has placed in the safekeeping of this artifact is equivalent to the value it has put on its own heritage and its peaceful relations with a neighboring nation.